Although the date was pretty much already known by past releases – through a post on the blog of the official Call of Duty Community it was announced that the Black Ops 2 Revolution DLC will be hitting the PC platform on February 28th. 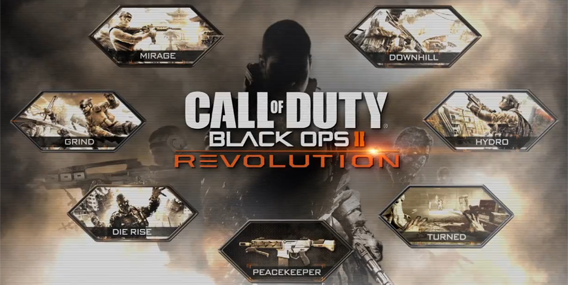 If you are following the announcements surrounding Black Ops 2 at all then you already know what is included but if you don’t – the Revolution DLC contains four new multiplayer maps called Hydro, Grind, Downhill and Mirage, a new multiplayer weapon called the Peacekeeper, a new Zombies map called Die Rise along with a new Zombies mode called Turned where you can now play as a Zombie for the first time. You can checkout the official Revolution DLC launch trailer below. It’s hard to ignore all of the information out there floating around from all of the XBOX people playing the new maps but I try to avoid it as much as possible to leave at least a little element of surprise for when I can get my hands on it for the first time. I am actually looking forward to some new maps to play but I am concerned about the matchmaking playlists and server setup and how we will actually be able to play the new maps. I played Modern Warfare 3 for a bit but I didn’t touch any DLC for it so my experience on how DLC integrates with the matchmaking playlist system is kind of lacking. I sure hope the DLC isn’t segregated to playlists with ONLY DLC. I want it all mixed together so both new maps and stock maps can be played – but then again we have no control over that now its kind of out of anyone’s hands but Treyarch’s.